Among the many sad stories coming out of Haiti is the news that six sisters of the Daughters of Wisdom were caught in the rubble. Three were killed; the others are not believed to have survived. 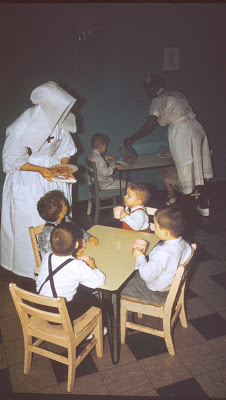 St. Mary’s Home for Disabled Children in Norfolk has had a special connection to the Daughters, a congregation of Catholic religious women, for most of our 65-year-history. About a year after the Home opened in December 1944, a group of sisters from the order arrived from New York state to manage the residence. The last remaining nun at the Home, Sister Mary June Morin, is celebrating 50 years of service at St. Mary’s. This entry was posted in Daughters of Wisdom, earthquake, Haiti, Sister Mary June by marcomm. Bookmark the permalink.